I read this article and found it very interesting, thought it might be something for you. The article is called From Del Boy to Del Diva: Ruth Ní Loinsigh and is located at https://www.totallydublin.ie/more/from-del-boy-to-del-diva-ruth-ni-loinsigh/. 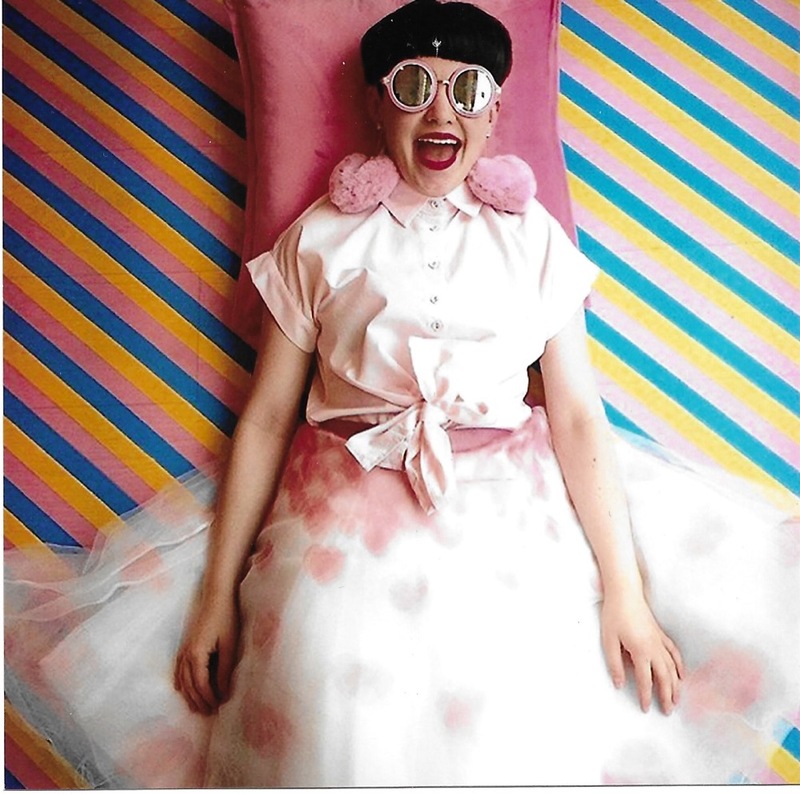 Ruth Ni Loinsigh, Dublin’s Queen of Colourful, Compassionate Retail, relives a remarkable two decades at Om Diva’s helm. For both clothing connoisseurs and fashion neophytes, first-time visitors to Om Diva struggle to encapsulate their experiences in a single word. 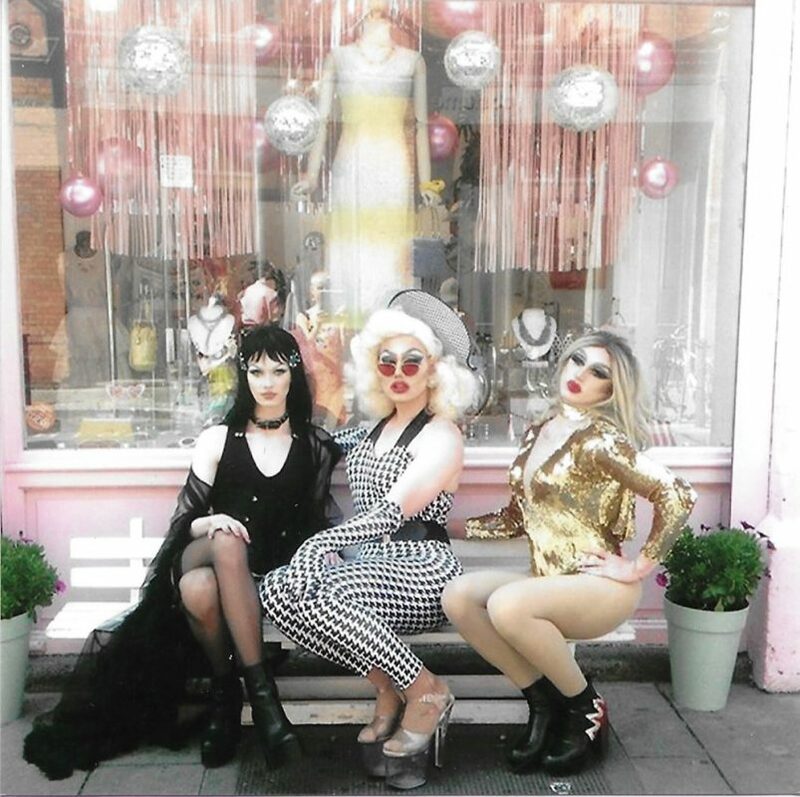 A multi-faceted design emporium, holding court on Drury Street amidst a myriad of independent retailers, Om Diva charms both long-time locals and curious out-of-towners with equal bursts of enthusiasm. It is impossible to traverse the boutique’s four floors – a vivid mélange of vintage gems, contemporary threads and the most desirable of emerging Irish designers – without channeling kid-in-a-candy-store sensations. If these opening lines seem too replete with purple prose to substantiate, I implore you to venture inside; where the boutique’s effervescent atmosphere melts the hearts of even the staunchest style critics. While carefully-curated stock plays an instrumental role in decoding Om Diva’s magnetic appeal (the vibrant frocks that line its vintage basement, for example, are procured from the unworn, unsold stock of 1950s Korean department stores), the quickest way to understand its lure is by going straight to the source: Ruth Ni Loinsigh. A long-time colour devotee and (cool) fairy godmother of upcoming fashion designers, Ni Loinsigh founded Om Diva as a Blackrock Market stall, bursting at the seams with wares from her travels to India. Twenty years, two boutiques and countless clocked-up air miles later, her scintillating approach has only grown stronger with each passing season. 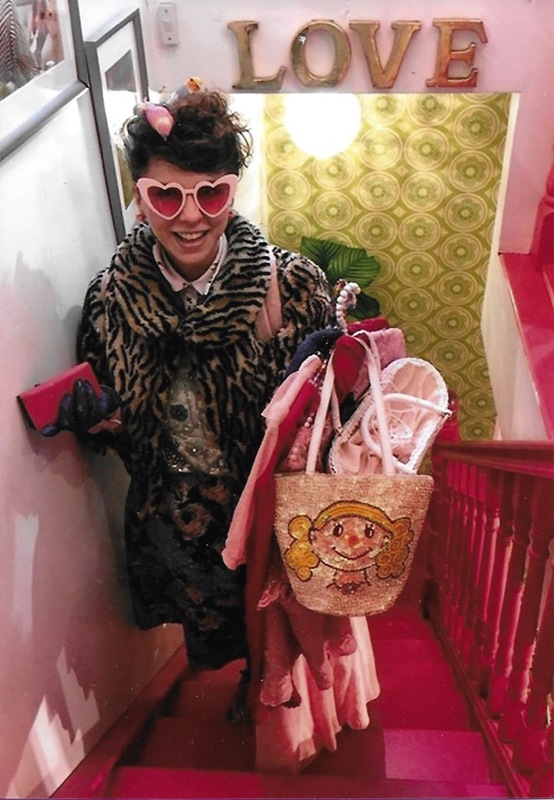 Having personally stepped into the glitter-covered shoes of Diva shop assistant for nearly five years, the eclectic tales spawning from Ni Loinsigh’s life trajectory have become familiar terrain; as familiar as quarterly creative meetings over salt and vinegar chips, or dancing up to the attic stock room on delivery day. Nevertheless, while sitting on Om Diva’s iconic bench with Ni Loinsigh – the cerulean Dublin sky providing the perfect contrast to her tangerine-hued dress – a multitude of unheard anecdotes invariably pour forth. Unsurprisingly, Ni Loinsigh’s love of colour has been a lifetime affair. “It gave me that effervescent feeling of joy, from a really young age. I grew up in the 70s, and we lived in this old, crumbling house in Drumcondra. With my mum, grandmother, grandfather and uncles all working in the rag trade, I was constantly surrounded by sewing machines, bags of buttons, scraps of remnants.” By her own admission, she’s never been well placed with a needle and thread, but her subsequent discovery of an inner merchant’s savvy (“I love the buying and selling – I’m kind of like Del Boy… Del Diva!”) proved that technical skill wasn’t a prerequisite to work in fashion. Much of Ni Loinsigh’s early life decisions placed clothes at the centre of every equation. Her choice of studying economics and languages in UCD – with economics quickly dropped – was in large part due to her taste in campus architecture, considering how well it would compliment her wardrobe. “I loved the idea of being surrounded by these Brutalist buildings, and thought, ‘Oh my god, the clothes I could wear here.’ I could imagine myself walking through those concrete concourses in black and white striped jumpers – and I was in a back-comb phase – so really, it was a visual decision based on what I could wear to college.” She announced her arrival in Venice – for an Erasmus year – in bright-pink petticoats, standard Ni Loinsigh attire that astonished the Northern Italians (the latter not usually known for wearing bright, Benetton-esque colours, contrary to popular belief). But the Venetians quickly embraced her vivacious dress sense, coming to her student digs with cheap bottles of wine to dress up in her clothes. College was followed by six “glorious years” of backpacking across Europe and Asia, a hugely formative adventure that proved indispensable for Ni Loinsigh’s subsequent ventures. “It would be a roasting-hot Monday in October and I’d be there thinking, ‘my friends are in work in an office!’ I couldn’t understand why people didn’t want to travel. I think that fashion and travel really go hand-in-hand, personally-speaking. For me, it gave access to other cultures, other fabrics. [It wasn’t] the same as in European countries, where you have to go to fabric shops and buy by the metre – I’m talking about fabric markets, and tailors with reams and reams of rolls and colour and glitter and feathers!” Forging a strong rapport with her Indian master-tailor, Ni Loinsigh harnessed her sketching prowess to create her first collections. Travelling on to a year in Berlin, where she enjoyed post-Iron Curtain raves in East-German airport hangars, she ultimately returned home to Dublin and procured an office job; symbolically spray-painting her baby-blue raving platforms black in the process. With an unusual twelve months under her belt – hopping from one of the earliest Internet-banking companies, on Harcourt Street, to a motherboard-building run at Gateway 2000, to a brief spell at United Airlines that brought cheap flights and rekindled her ties to India – Ni Loinsigh packed in the day job in 1998 and officially launched Om Diva full-time. Its initial Blackrock stomping ground was followed by Mother Redcaps Market, George’s Street Arcade and, finally, in 2005, its current perch in the Creative Quarter. Om Diva has evolved from a “colourful hippy shop” into an epicentre of innovative design that celebrated a milestone birthday last month. The bash was an homage to Om Diva’s long-established love of parties, promoted over the years through beautifully-illustrated posters (with themes ranging from “the Teddy Bear’s Picnic” to “Back to the 80s”; each gathering more extravagant than the last). Om Diva may have garnered a wealth of positive memories over the course of its lifetime, but make no mistake – the boutique is looking firmly to the future, bringing its perennial ethos of endorsing young designers to unprecedented heights. September sees a gaggle of 3rd year students on NCAD’s Jewellery & Objects course (tutored, in part, by Sally Collins, who couples her lecturing duties with designing imaginative collections under Super Frilly Lover) commence Design for a Diva, a concept cooked up by Collins and Ni Loinsigh after a creative meeting this summer. It’s a colourful offshoot of the course’s Diffusion initiative, whereby each participant designs a collection true to their creative ethos, whilst gaining invaluable insights into the logistics of a jewellery business, from price-tagging to merchandising. The finished collections, including a specially-crafted Super Frilly Lover range, will launch on November 7 in Atelier 27, with Ni Loinsigh and the Divas singling out two designers that best embody the Om Diva aesthetic to produce their own bespoke lines, available to purchase throughout the Christmas period. On the cusp of mentoring a new assemblage of young designers, Ni Loinsigh’s excitement is palpable. “It’s really great to be involved with NCAD. When you leave school and go to college, you get that instant connection – but when you leave college, sometimes it can be difficult… there’s a bit of a cliff edge that, sometimes, you just fall off. So this is a really safe stepping-stone; it’s a very nurturing environment, but at the same time it’ll be a realistic, commercial environment. It gives them an idea of the marketplace, how people respond to their pieces, things that can be improved upon, learning about the commerciality… Hopefully if this concept works, it’s the first of many such collaborations.” The fate of Irish design’s future groundbreakers couldn’t be in more capable hands.